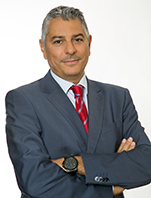 Nicholas Hadjiyiannis holds a degree in Quantity Surveying from the University of Reading, U.K and a Master's degree (1995) in Shipping Trade and Finance from City University Business School, London, U.K. He is a Fellow Member of the Royal Institute of Chartered Surveyors (FRICS) UK. He worked from 1995-2013 in Bank of Cyprus, Greece & Cyprus, Merrill Lynch, Greece & U.K, and BNP Paribas, Cyprus and Switzerland. Following the Troika support programme of Cyprus in 2013 and the recapitalization of the Banking system he was appointed and served as Chairman, for 2 years, of the Board of Directors of the Cooperative Central Bank Ltd (CCB), Cyprus, the second biggest systemic Bank in the country. In December 2015, he was appointed CEO of the Bank, managing it in a complete transformation and restructuring process and working its way towards a local stock exchange listing.